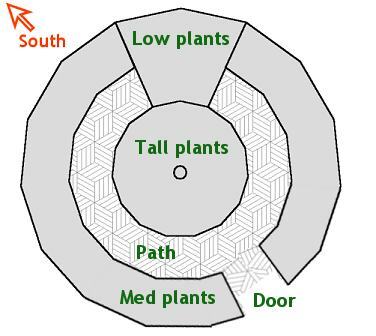 For those who like gardening and are considering building a dome greenhouse instead of a traditional greenhouse or a poly tunnel, the layout plans below will give an idea just how much better growing plants in a dome can be. 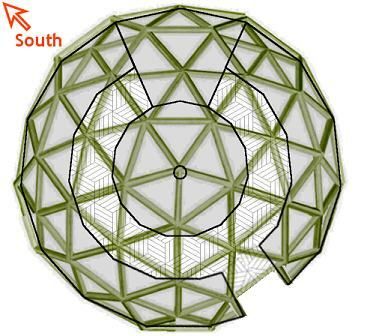 The plan below shows a 3v geodesic dome greenhouse with the beds arranged around the edge of the dome and a central bed for growing tall plants. Plants of 8 or 9 feet tall can be grown in the centre bed and take advantage of the full height of the dome – In a traditional greenhouse or poly tunnel the path is down the centre preventing use of the tallest part of the greenhouse. With the use of a rotary lawn sprinkler all the plants can be watered evenly from the centre of the dome. – Much more complex watering systems are required in a conventional greenhouse. Two people can work in different parts of the dome without the need to push past each other to enter and leave the greenhouse. Domes have better air circulation and are better at distributing sunlight than ordinary greenhouses. They’re also stronger and have less surface area so are more efficient at retaining heat on cold winter nights. Hi Paul, I`d put the tall plants in the north wall bed. That way they gain a longer growth path to the top of the dome (netting?) due to the curvature and they can`t shade anything out behind them. Unless you want shade plants on the north side, then the tall plants in the middle would be really good. I would think about not glazing the north side as this can cause problems for the plants in winter and instead insulating with foil insulation on those panels. To make it worthwhile use a rigid waterproof insulation. Its also worth considering the quality of diffused winter light from directly above is actually better for plants than the direct low angle light. Why not put reflecting foil on part of the North Side? That way you can increase the amount of light in the dome during winter. Also the centre section could be a cylindrical heated fish tank (using active solar) with hydroponics around the edge... Note: I havn't got one of these or even a garden and I'm green with envy! (and as you can see keen to experiment ASAP :o) Nick.